I'm more than willing to take a look at anything from the maker of The Grudge, director Takashi Shimizu. From the sounds of reviews for this, his latest flick, my stance on Shimizu could, unfortunately, change pretty fast. Japanese filmmaker Takashi Shimizu made a huge name for himself during the big �J-Horror� craze in the early 2000s, thanks to his helming of Ju-On: The Grudge (2002) and Ju-On: the Grudge 2 (2003), as well as their English-language remakes, simply titled The Grudge (2004) and The Grudge 2 (2006). Shimizu was arguably the second biggest filmmaker in Japan at the time, only playing second-fiddle to Hideo Nakata, the man that started the whole J-Horror phenomenon with 1998�s Ringu (eventually remade as The Ring). Since the Grudge films, however, Shimizu�s career has sputtered, as he�s helmed very few feature films, and been relatively absent from the cinematic limelight. Shimizu�s latest stateside attempt at a career renaissance is the long-delayed (yet not necessarily long-awaited) Blu-ray release of his 2009 3D film, The Shock Labyrinth. 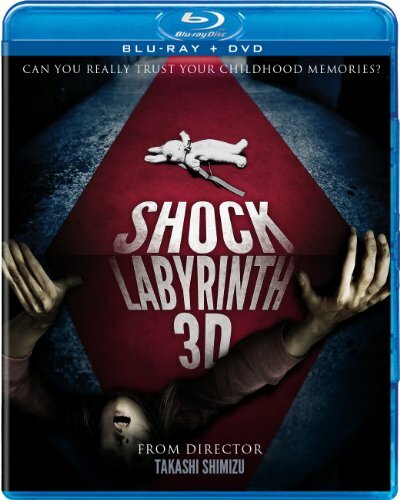 Referred to everywhere on the packaging except the actual credits as simply, Shock Labyrinth 3D, Well Go USA�s release is a solid attempt to mask a rather horrible film with a solid Blu-ray disc. Ken (Yuya Yagira) has recently returned home, where he hasn�t been since his mother�s death. He reunites with old friends Motoko (Ryo Katsuji), Miyu (Erina Mizuno), and Rin (Ai Maeda), who is blind. Another friend, Yuki (Misako Renbutsu), also makes a sudden appearance, but hers is a more shocking return, as she was thought to be dead. It isn�t long before Yuki is injured, and her friends have to rush her to the hospital. They learn quickly that this hospital is one of the creepiest establishments in the world, and its labyrinth qualities make it impossible to leave, let alone navigate from room to room. As their collective fates lie in the balance, secrets are revealed, and this group of friends will never see each other in the same way again. �Boring� is pretty much the best word to sum up Shock Labyrinth 3D, regardless of whether you�re watching it in all of its ghosts flying at you in 3D glory, or the standard, 2D version. Both are dreadful, and an extreme chore to sit through, as the paper-thin, hole-filled plot feels like the product of a screenwriter (Daisuke Hosaka) who isn�t even trying to make us believe that he�s trying. Instead of anything resembling an engaging story, we simply get dark, dreary set piece after darker, drearier set piece, with only a handful of cheap, jump-scares and even cheaper- looking CGI effects that are borderline sad. Also, around to both put us to sleep and confuse the hell out of us are numerous shifts between the past and present, pretty much a staple of Shimizu�s (and many others� for that matter) earlier, J-horror hits, that just feels overdone and tired. The young actors can do nothing to salvage any semblance of a cohesive film either, and we�re pretty much left wondering if Takashi Shimizu has completely lost his filmmaking touch or if any of his upcoming movies could possibly get back on movie-lovers� good side. Despite the total mess of a film housed here, this Blu-ray/DVD combo pack does a nice job making things look and sound better than they should. The Blu-ray disc offers the feature film in both 2D and 3D, with the latter requiring a 3D-capable TV and accompanying glasses. The 1.85:1, 1080p presentation contains enough image detail to combat what could have been a problematic, overly dark mess. It�s difficult to hide the shoddy effects work, though, and compression artifacts and too much noise bog things down. A DTS-HD Master Audio 5.1 track keeps us as engaged as possible, thanks to excellent directional effects, surround usage that provides the only few scares that the movie offers, and crystal clear dialogue throughout. The extras include nearly a half hour of cast and crew interviews, 10 minutes of behind the scenes footage, a look at a post-screening press conference that took place back in 2009, and the original trailer for The Shock Labyrinth.